It may sound like a surprising fact, but believe it or not mid-range phones under 5-inches are still a growing business, and at the head of that business is the Samsung Galaxy Core Prime 4.5-inches, although as good as it sounds it suffers from minimal internal storage, and bloatware that reduces its usability. However, if what you need are calls and a few apps, then, the Samsung Galaxy Core Prime is all you need. The Samsung Galaxy Core Prime has a price tag of $144 and looks like a shrunken version of the Galaxy S4, with the same capacitive Home Button and central camera layout, it also has the same metallic frame built on polycarbonate. The measures are 5.15 by 2.67 by 0.35-inches and weigh a total of 4.59 ounces. Its compact dimensions make it for one-handed use and pocketability. The POWER button stands in the upper right side, while VOLUME control is on the upper left. Uses a micro-USB port and headphone jack. 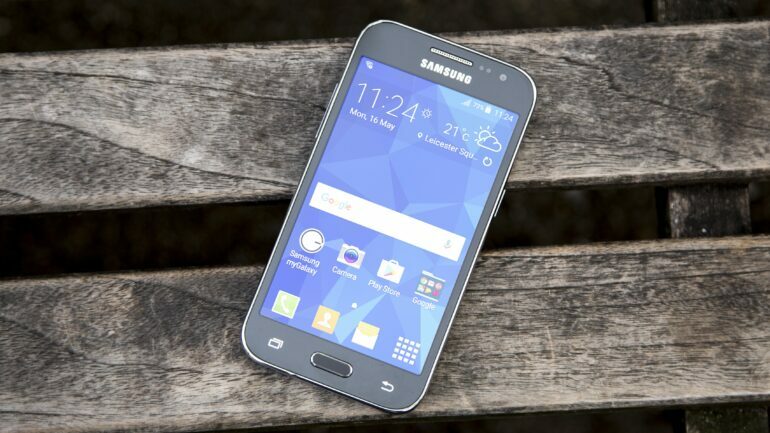 The Samsung Galaxy Core Prime has a 4.5-inch, 800×400 display that really looks better than you think. Despite having a lower resolution than other members of the mid-range family, it does produce some amazing bright colors, very rich and a clear viewing on every side, and really holds its grounds on the outdoors. The Samsung Galaxy Core Prime comes power up by a Qualcomm Snapdragon 410 with 1.2GHz and a 1GB RAM. Multitasking is very possible on this Phone, as long as you don’t try to run too many heavy apps. It has a solid gaming performance, which is another plus on our list. The camera performance is also very good, the 5MP rear sensor, takes some decent outdoor pictures, with a good coloring reproduction, it does a have a rather slow lock-and-focus feature. It records a solid 720P at 30 frames per seconds. The frontal camera stands at 2MP, more than enough for selfies and just that. The Samsung Galaxy Core Prime comes with Android 4.4 KitKat as default, but it can be updated to 5.1 Lollipop, and that is it, don’t expect any other significant upgrade at least on the software section, but that isn’t much of a problem, since most mid-range Phones will only have one OS upgrade in most cases, others are stuck with that they have. As it is usual with Samsung Android Phones, it comes with the TouchWiz UI, so you’ll get all those flashy settings these Phones have come to be known for (besides their awesome performance). One problem though is that after the upgrade to 5.1, you’ll be left with a worrisome 1.55GB left in storage, and a lot of bloatware from the company provider (Verizon in this case) and even Amazon has dropped a few, that in the end, are just duplicating google apps that do the same things, and even better. The internal storage is a definite problem for the Samsung Galaxy Core Prime, you can expand the MicroSD storage up to 200GB, but you are still going to be unable to move the bloatware to the SD, which is a true problem.